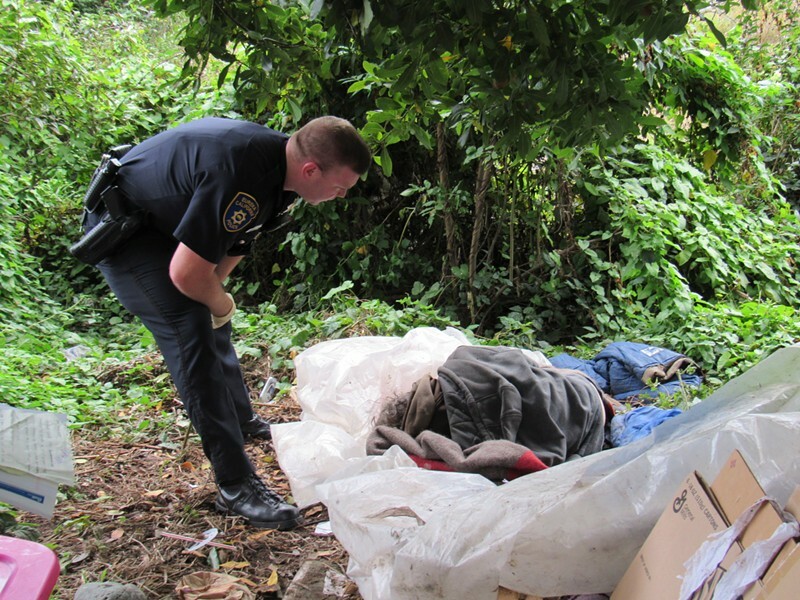 Measure Z Funding for Eureka Aims to "Restore Hope"
EPD officer contacts a homeless man camped in greenbelt. The city of Eureka has been approved for $400,000 in Measure Z funding to address homelessness, as part of a project titled "Operation Restore Hope." The majority of the money, $242,000, will go toward funding positions for two police officers to work with the county's Mobile Intervention and Services Team. MIST is a collaboration between the Eureka Police Department and the Humboldt County Department of Health and Human Services. Its team members work to stabilize and support the homeless and mentally ill. Eureka Police Department Chief Andy Mills confirmed the department has rehired two annuitants, saying that their contribution will be "broader than the MIST team." "These annuitants are also working directly on the homeless problem all over the city," said Mills. EPD laid off annuitants and most of its public service officers in August due to a city budget shortfall. Mills added that his department's recent change in approach to homeless living behind the Bayshore Mall — pushing campers north to a flat, accessible spot — has not resulted in a significant amount of displacement, though he has been getting complaints about a more visible homeless presence in other parts of the city. "Any funding is helpful to deal with this problem, which is obviously pretty severe," said Mills. The initial request included funding for a police vehicle, which was not approved. But another $157,000 was allocated for transfer to the DHHS, to be used for housing and addiction treatment. DHHS spokesperson Heather Muller confirmed that $30,160 will be used for permanent supportive housing for the chronically homeless and mentally ill. Muller said that many who fit this description qualify for supplemental security income, but SSI (which tops out at $733 a month) is an inadequate amount to pay rent. The $30,160 in funding will cover 70 percent of rent in permanent supportive housing, while clients will pay the remaining 30 percent. Another $45,000 has been allocated for rapid-rehousing, aimed at clients who are "down on their luck," according to Muller. It will provide $1,000 per household for security and utility deposits. This is for clients who are not chronically homeless and can transition easily into housing but have exhausted all other resources. Another $82,640 will be provided for alcohol and drug residential treatment, which includes a three- to seven-day detoxification service and a 30-day treatment program. The Humboldt County Board of Supervisors today approved contracts with the cities of Fortuna and Eureka regarding Measure Z allocations. The contracts describe in detail the actions to be carried out by the agencies receiving funds from Measure Z, the half-cent sales tax approved by voters in November. Three other Measure Z contracts were approved in August. The City of Fortuna’s allocation of $125,000 will fund a full-time police officer assigned to the Humboldt County Drug Task force. The task force is a multi-jurisdictional group that has been in existence for more than 20 years. It is comprised of local law enforcement agencies that dedicate staff to combat mid- to major-level narcotic offenders in all jurisdictional boundaries of the county. The City of Eureka’s Measure Z application for $400,000 included a portion for homeless support services. The city will receive $242,200 for two police officers to work with the county’s Mobile Intervention and Services Team (MIST), which is a collaboration between the Eureka Police Department and the Humboldt County Department of Health & Human Services (DHHS). The MIST team works specifically with people who are homeless and need help stabilizing their mental illness and securing services and assistance they need to avoid further problems. •	$45,000 for rapid re-housing, which typically provides $1,000 per household for security and utility deposits, and some periodic rental support. In an effort to clearly show how each agency is spending Measure Z funds, the outside agencies will submit quarterly reports and itemized invoices to the county. These materials will be made available on the county’s website at humboldtgov.org/MeasureZ.